Some weeks you have a lot of time to be a panda-person. And some weeks, you don't. Though I didn't have as much time to take my ferocious little blue-haired pandaren rogue around the Eastern Kingdoms as I had hoped, still, I made some progress. I killed things and completed quests and uncovered areas of the map, and overall, as I reached and passed level 20, finally began to settle into a comfortable MMO groove. It was assassination that did it for me, really. I originally tried the Combat specialization, thinking it would be akin to the swashbuckler I played many moons ago in another MMO. And it was! I got a boost to AOE damage. Then I remembered that I didn't enjoy playing that swashbuckler much at all, and I went and found a trainer I could respec with. Assassination suits my temperament much better, and as I began to sneak through canyons and caves, leaping from the shadows to fell my targets, combat started to gain a meaty feel that I could really get into. Being genuinely new to the game at this late stage has its advantages. While other players have had to unlearn tactics and ideas, and had to adapt to new geography and lore, from my perspective everything just... is. And while even I can see some of the seams that joint the eras of the world together, from my low-and-leveling perspective everything so far is either the Wandering Isle, and therefore known to be brand-new, or it's not. But being a newbie has disadvantages, too. The lack of connections and accumulated time and goods is starting to become a problem. I realize, just from looking around me while in-game, that eight years in currency flows like water, and despite money sinks of all kinds no doubt high-level players aren't hurting for cash. But at level 20, I found myself standing in Stormwind, mentally jingling my painfully empty purse in one hand. Thanks to playing the collector's edition of Mists of Pandaria, I had both a battle pet and a mount waiting for me in the mail. But all my questing and leveling so far had left me with only enough gold to train either pet battling or riding. I picked riding. My panda's tail is cute and all but I'm sick and tired of watching it run around zones at a snail's pace. It's a big world, and traveling it on foot gets tiring, even with occasional purse-draining trips by gryphon. Kotaku's MMO reviews are a multi-part process. Rather than deliver day one reviews based on beta gameplay, we play the game for a few weeks before issuing our final verdict. Once a week, we deliver a log detailing when and how we played the game. We believe this gives readers a frame of reference for the final review. Since MMO titles support many different types of play, readers can compare our experiences to theirs to determine what the review means to them. 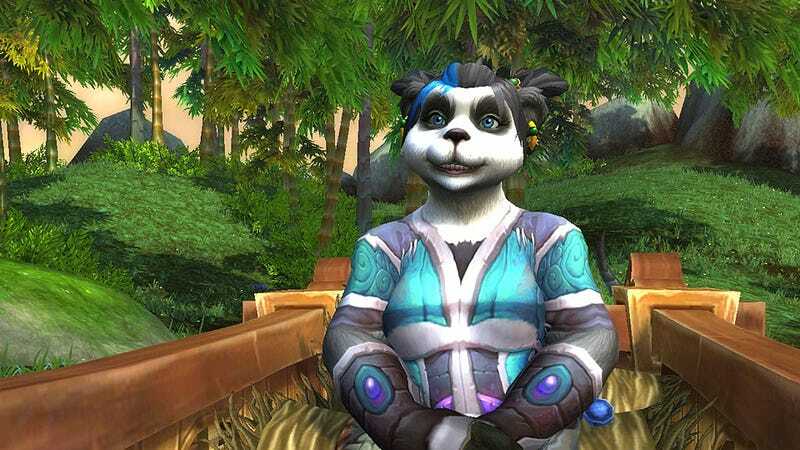 Previous looks at Mists of Pandaria: log one, supplemental, and log two.